Is your driveway old and cracked? This happens to all driveways over time. Most of the time driveway issues are due to drainage problems. Are you looking to have an oasis in your backyard? We excavate pools for do-it-yourselfers or pool contractors. Over 3,000 excavated since 1975. We also fill in pools when no longer wanted. Having an outdoor entrance to your basement may not sound like anything special, but there are many new possibilities for the space by giving people direct access to it. Richard Nero Backhoe Service provides these services and much more for the people in the Cleveland area. We take great pride in our experience in the execution of a wide variety of excavation projects. Not only because it gives us a reputation which is hard to beat but because it shows us that our clients appreciate the work we do for them. We would not have gotten where we are today if we did not make customer satisfaction an equal priority with efficiency and safety. Sometimes it may be tempting to attempt a ‘do it yourself’ excavation project because it will save you a few extra dollars. However, there are some factors you need to consider to properly weigh the possibilities. First, how large is your project and how much time can you personally spend on it?. We can get the job done fast not only because we have the right equipment but also because we have the experience to handle any problem which may arise. Second, are you insured in the case of injury? 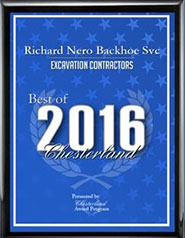 Richard Nero Backhoe Service is a fully insured and certified company so our customers have peace of mind with our service. Third, do you know where your pipes and utilities are located and what the protocol is in the case that they are damaged? We are expertly trained to make sure that we never breach the surface of a pipe or utility line and have the know-how to dig them up with as minimal risk as possible. 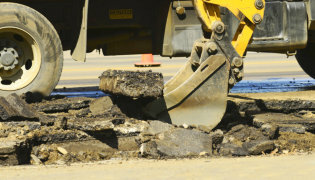 For these reasons and more it may be time to call Richard Nero Backhoe Service to aid you in your excavating project. 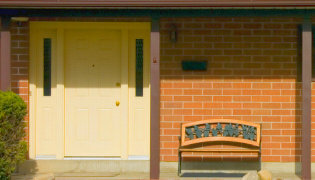 We offer a free estimate before any job we take on so you know you get the best price for the service. This is a highly dependable and trust-worthy company of over 40 years. Reasonably priced. No job too small, even ½ day minimum. All information provided is provided for information purposes only and does not constitute a legal contract between Richard Nero Backhoe Service and any person or entity unless otherwise specified. Information is subject to change without prior notice. Although every reasonable effort is made to present current and accurate information, LinkNow™ Media makes no guarantees of any kind.